Snowsport England has said that thousands of people have engaged with skiing and snowboarding since the start of autumn. That's with winter only having just begun. Snowsport England ran a season-starting participation initiative called 30 Days of Snowsport. It ran throughout the month of October, with 21 snowsports clubs and facilities taking part. This initiative offered up a grand total of 596 opportunities to participate in skiing or snowboarding. A huge number of people - 8,500 in fact - engaged with snowsports during this October programme. 1,500 more people got involved this year, over the number in 2017. Tamworth SnowDome and Kendal Snowsports Club saw huge numbers passing through their doors throughout October. North Staffs Ski Club offered free skiing and snowboarding to those new to snowsports. 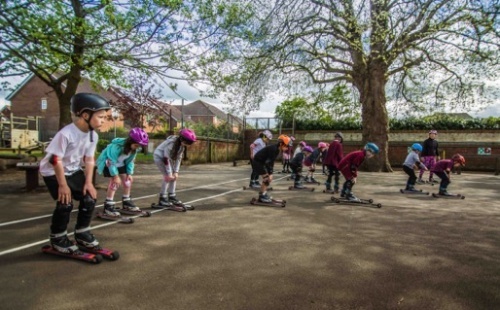 In York people were encouraged to try roller skiing for the first time with open sessions at the York Go Rollerski Club. There were sessions at Snozone Castleford for visually impaired skiers and there were taster sessions on offer at the Ski and Snowboard Open Weekend in Chatham. "30 Days of Snowsport is a great addition for the SnowDome during October," Marketing Assistant at SnowDome Dan Norgrove said. "The additional taster sessions and beginner lessons we put on are always hugely popular and 30 Days of Snowsport helps raise awareness of those lessons and our facility. "The event helps kickstart the winter season and gets more people involved in our exciting sports." "We loved learning how to roller ski and we were thrilled to find out at the end of two hours that we looked like cross country skiers...from the waist down. "Such a fun evening for all involved, thank you!" "30 Days of Snowsport has again played a key role in exposing new people to skiing, snowboard and roller skiing, as well as giving people who haven't been on the slopes for a while the chance to try snowsports again. "We are proud that that initiative continues to stay strong in its fifth year. "We are also delighted to confirm that National Schools Snowsport Week will return for 2019. "Just as 30 Days of Snowsport gets new people into the sport, National Schools Snowsport Week is an even more targeted campaign aiming at school and college students, giving them free or low cost opportunities to get their first taste of snowsports." National Schools Snowsport Week will run next year from Monday 23rd June to Sunday 30th June. Snowsport England is already encouraging slopes and schools to sign up. 2018 saw 3410 participants from 103 schools and youth groups taking advantage of one of the 104 sessions run and 20 slopes or clubs across the country. For more information and to register interest visit the website here.